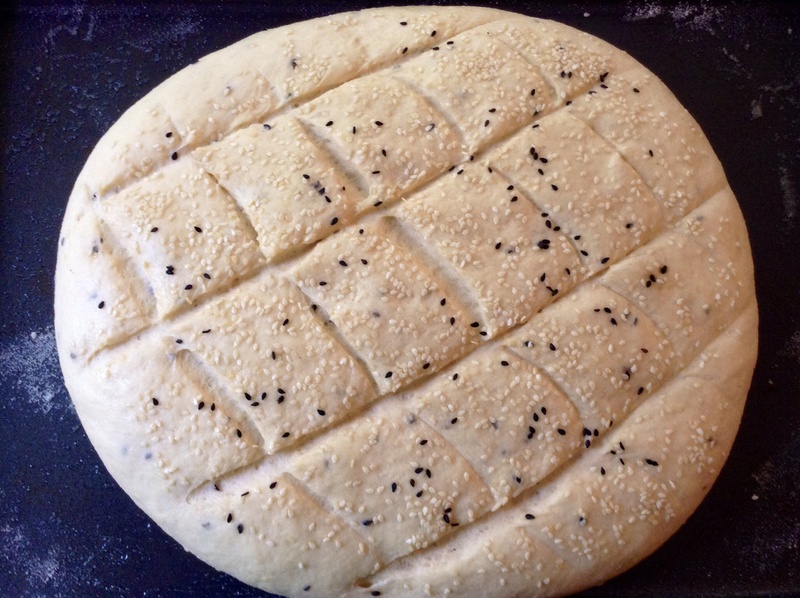 Khobz Mzaweq or Decorated Semolina Bread with Sesame & Nigella seeds….an extremely flavorful, robust chewy bread. You can serve it as a starter with some flavored Middle-eastern Herb-oil or Hummus. Use as an accompaniment with a Turkish warm vegetable salad, or a Moroccan Chick-pea Stew. 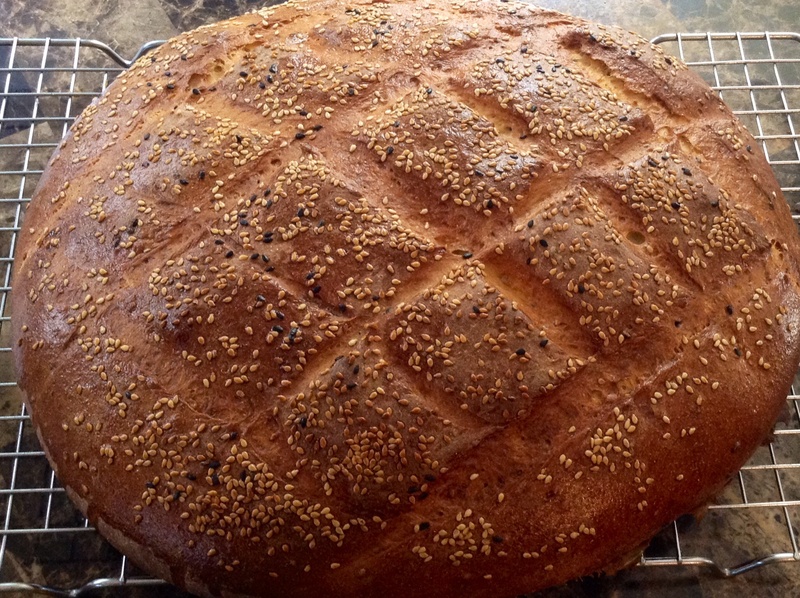 It’s hearty texture also makes it an ideal bread to serve with Chicken or Meat Tagines. 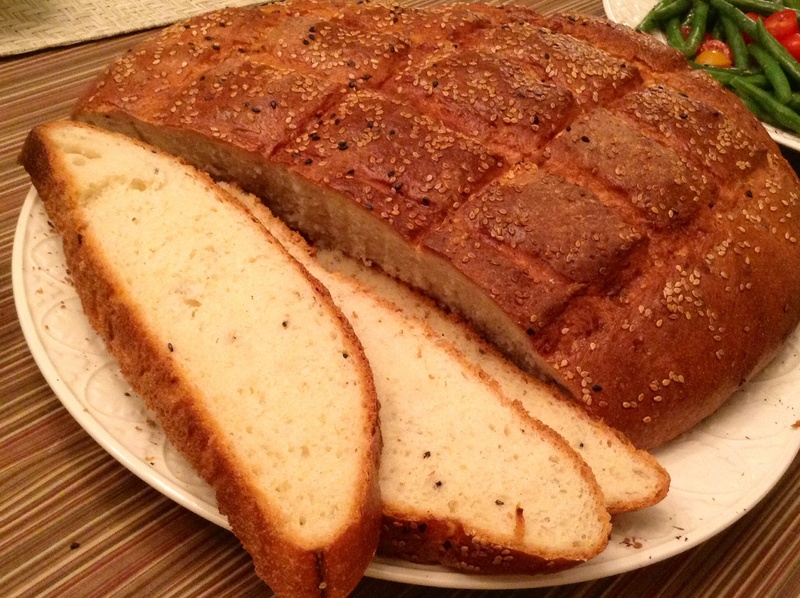 Any which way….it is an impressive addition to your middle eastern table! 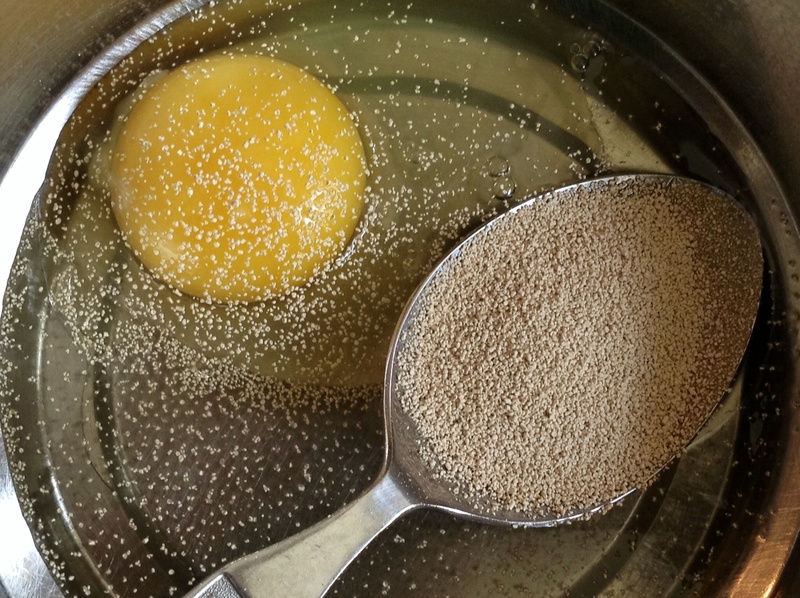 Mix the wet ingredients…egg, yeast, oil and a little water. to dissolve the yeast. 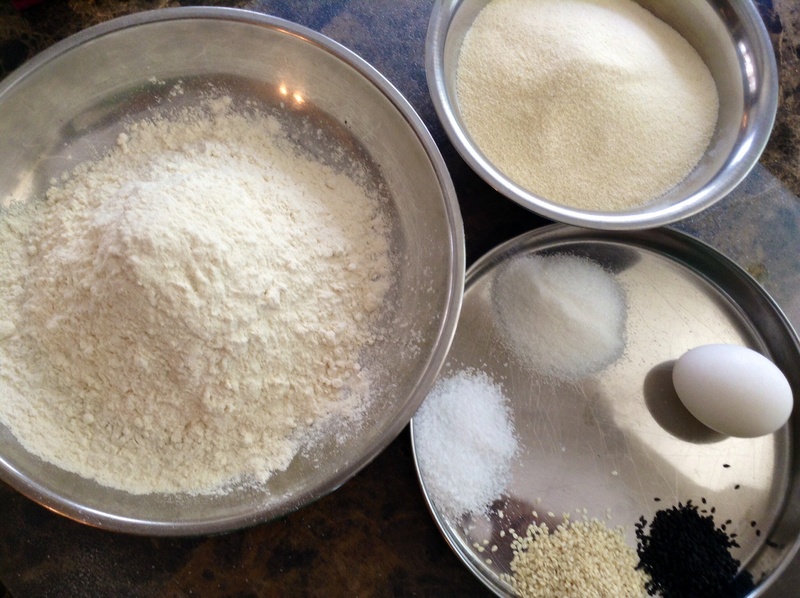 Make a large well in the center of the flour mixture and add the yeast mix. 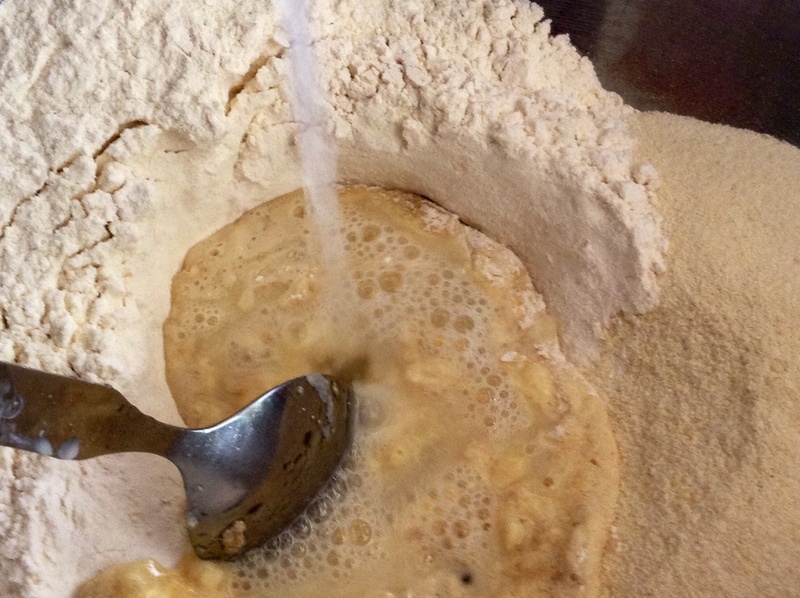 Now slowly pour the remaining water into the bowl and bring the flour together to form a rough dough. 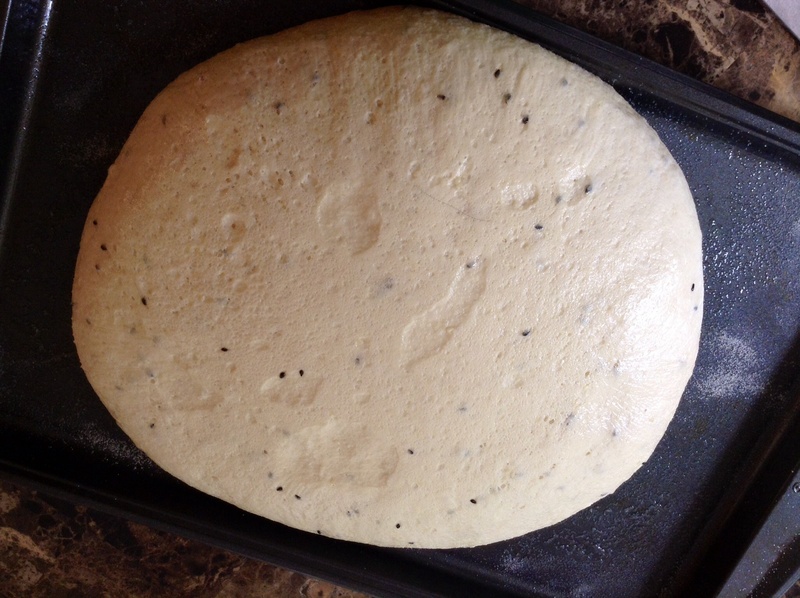 Turn the dough out onto a floured surface, and begin kneading the dough. 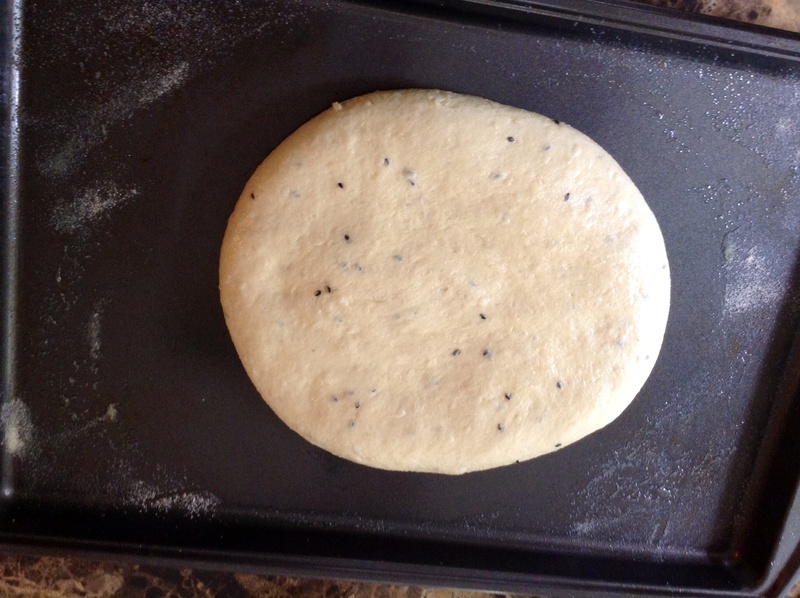 If necessary, add flour or water in very small amounts to make the dough soft and pliable, but not sticky. 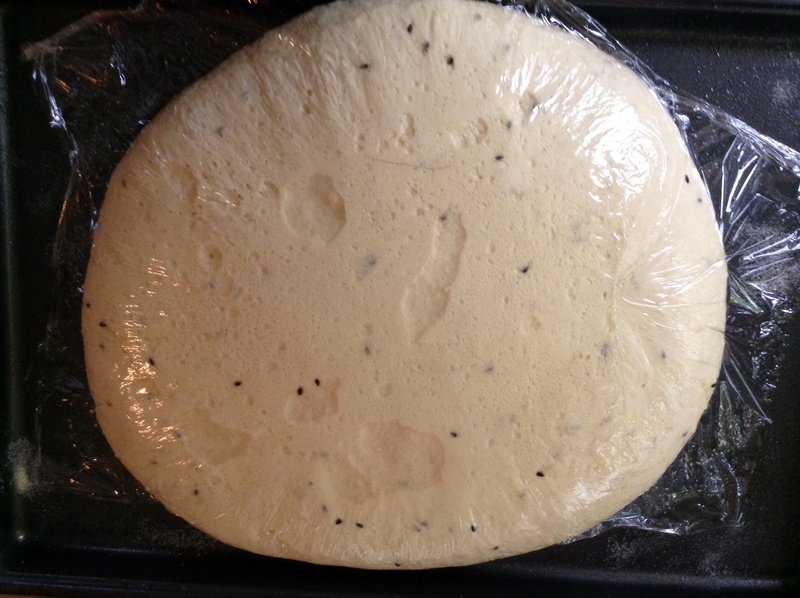 Continue kneading for 8-10 minutes, or until the dough is very smooth and elastic. 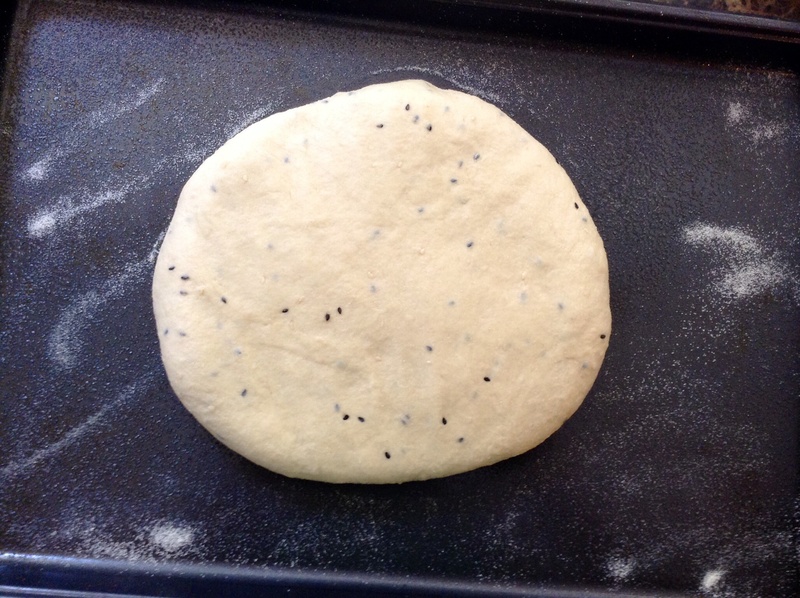 Prepare a baking sheet by oiling and then dusting the pan with a little semolina flour.Shape the dough into a smooth, circular mound and place onto the prepared pan. Cover with plastic wrap and allow to rest till it more than doubles in volume. 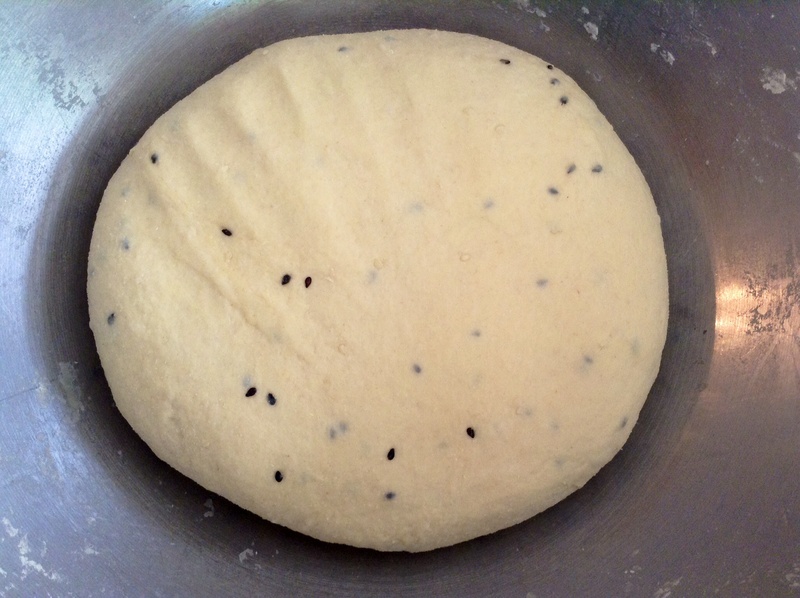 After the dough has rested, punch the dough to flatten, knead again and form into a tight ball. 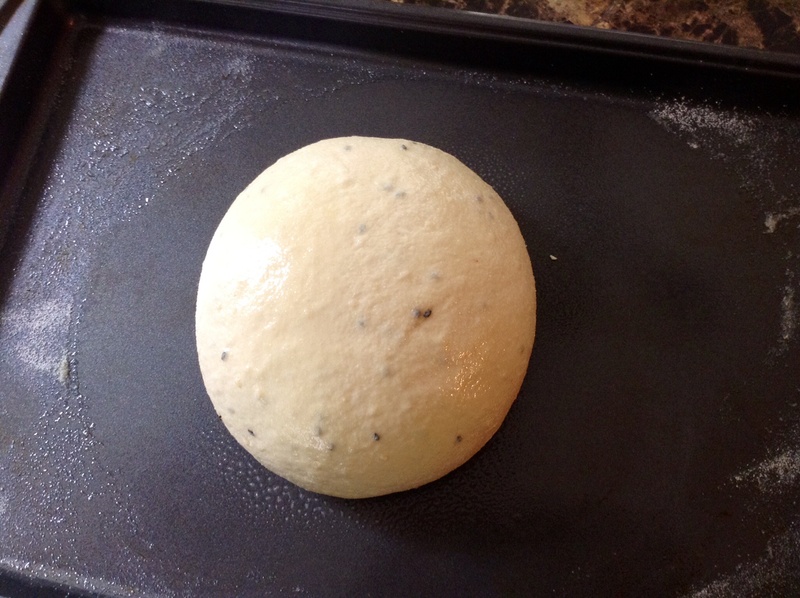 Press the ball of dough with your palm to form into a flat thick disc. 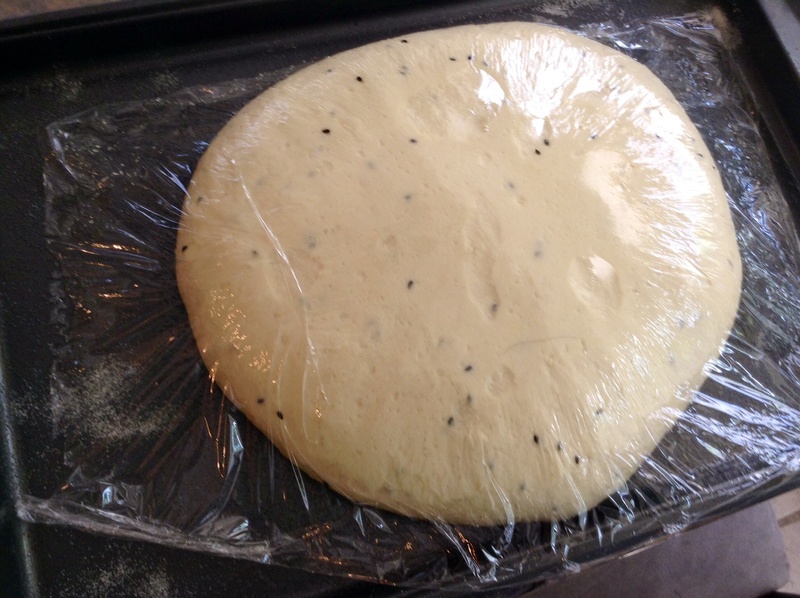 Cover with plastic wrap and leave to rise till it rises & puffs up again. Preheat an oven to 435°F (225°C). 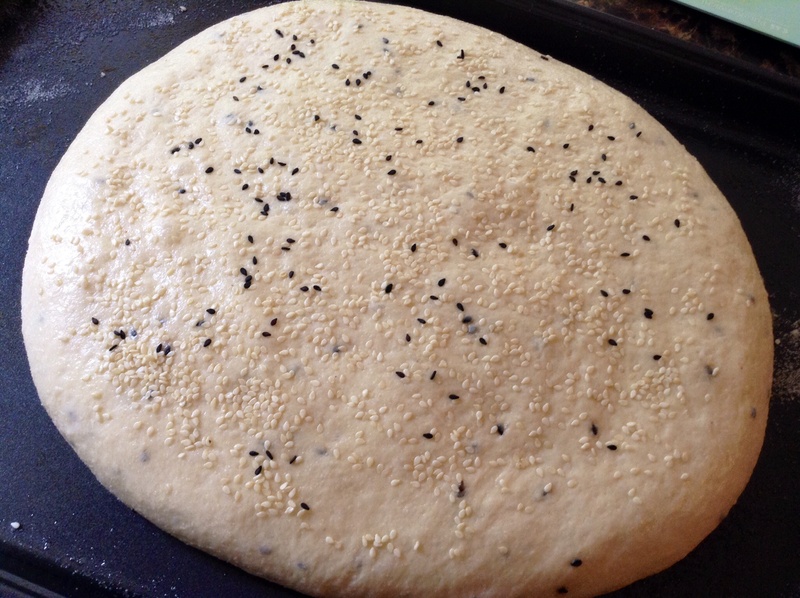 Sprinkle sesame seeds and nigella seeds over the surface of the bread. 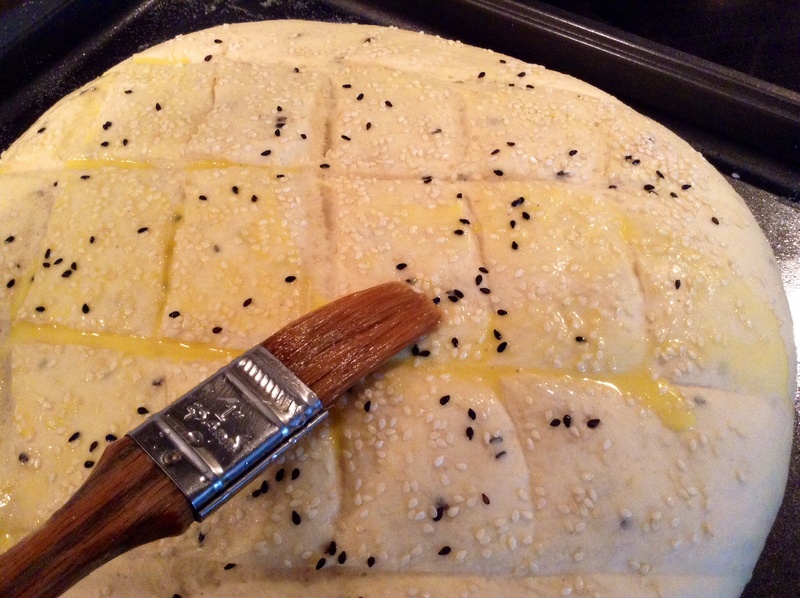 Lightly score the top of the bread with a very sharp knife to make a diamond shaped design. 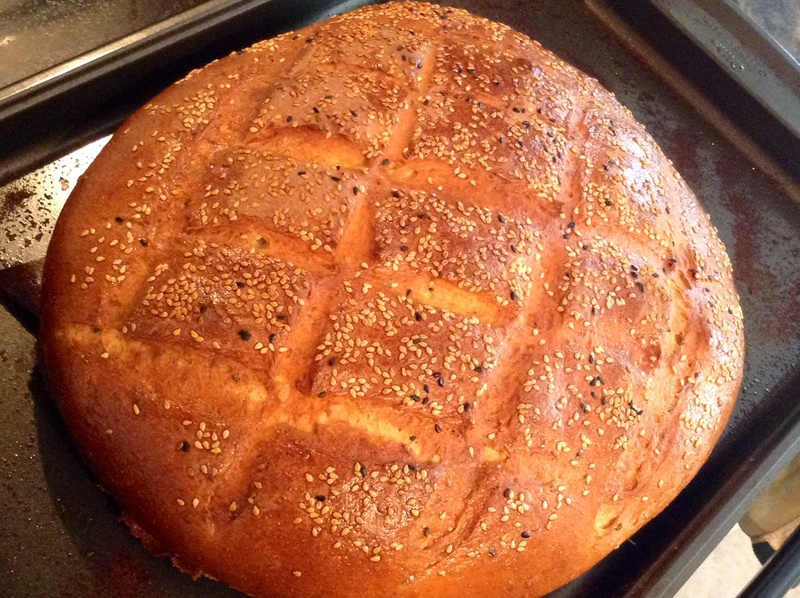 Bake the bread for 25 minutes, or until it is richly colored and sounds hollow when tapped. 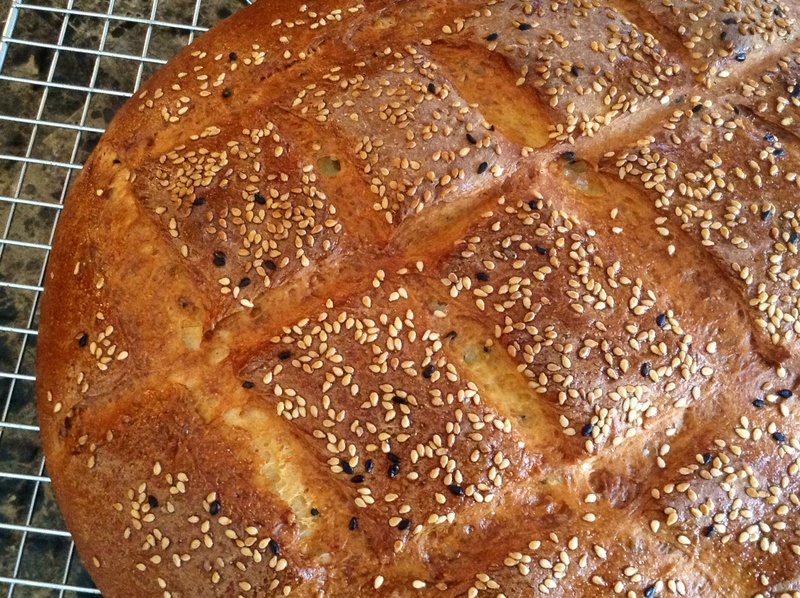 Transfer the bread to an oven rack to cool. Looks tempting. But what can be used as a substitute of an egg?